Research In Motion (RIM) this morning listed an early version of its new eBay for BlackBerry e-commerce application for download on its BlackBerry App World software store. The free, beta application lets BlackBerry users with eBay accounts search for items of interest, buy products–via PayPal–and check on account activity, all from their BlackBerry smartphones. I’m not an eBay user, so it’s difficult for me to evaluate the app and its overall functionality, but I know from excited reader response when the eBay app was first mentioned at the BlackBerry Developer Conference earlier this month that plenty of you will be anxious to download and employ the new software. In addition to the basic search- and purchase-related features mentioned above, eBay for BlackBerry also employs home-screen alerts to notify you if you’ve won an item, been outbid or a listing on your “Watch List” will soon expire. And you can add auction-related reminders to your BlackBerry calendar and find location-based search results from up to 1,200 miles away from your home location. And because the application is in beta, or testing, stages, RIM’s asking any and all eBay for BlackBerry users to submit feedback and suggestions for improvement via the BlackBerry App World eBay reviews section–simply search for “eBay” on App World, click the listing and then choose “Reviews” to leave your opinions/suggestions. RIM’s new eBay for BlackBerry isn’t the only BlackBerry app for eBay users, but it’s the only “official” app endorsed by both eBay and RIM. It’s also far more feature-packed than the alternatives, which tend to offer only a few specific eBay functionalities. Unfortunately, eBay for BlackBerry is currently only available to North American BlackBerry users located in the United States or Canada. At the time I published this post, I couldn’t find one single “review” of the eBay app on BlackBerry App World–to be fair, it was released less than an hour ago. So surf on over to App World and have your say. 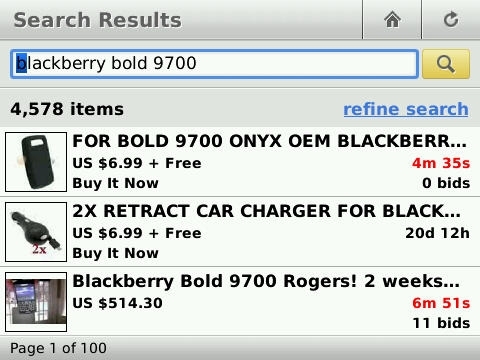 RIM’s opening up to its user base for feedback and now’s your chance to make eBay for BlackBerry the best it can be.